Two degrees centigrade (3.6°F) is the aspirational limit set in 2009 by the “Group of Eight” (G8) nations for global temperature rise as a consequence of greenhouse gas emissions. What does the G8 goal portend for the future? What has happened toward achieving the G8 goal in the ensuing 3.5 years? This article has been developed to address these questions, drawing primarily on data from three sources: the UK-government-commissioned, 2006 Stern Review – The Economics Of Climate Change, The Community Guide to Boulder’s Climate Action Plan 2010/2011 Progress Report (CAP), and the 2010 (US) National Academy of Sciences (NAS) – Climate Stabilization Targets: Emissions, Concentrations, and Impacts over Decades to Millennia. It is an effort to connect the dots from an array of data sets to establish an understanding of where we are headed and where we need to go to mitigate climate change. 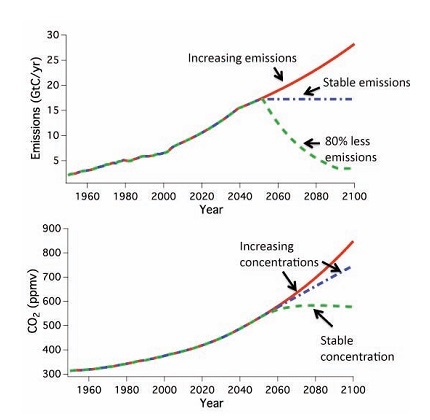 This dot connection should enable readers to understand the appropriate targets for emission reductions in order to stabilize global temperature rise at an achievable and survivable level. Such targets can be broadly applied to all emitting facets of our existence, including new building emission standards (i.e. building codes), existing building emission standards, transportation plans, parking policies, etc. For the most part, Parts I and II below are from the NAS and Part III is from the Stern Review. Much of the text in those three sections is either excerpted directly or paraphrased from those two research documents. Part I: What does 2°C mean and why is 2°C the G8 aspirational goal? The narrative below examines the current science regarding likely temperature rise as a result of human greenhouse gas (GHG) emissions, how emissions cause temperature rise over time, and how cumulative carbon is an appropriate metric for identifying probable global temperature increases. The carbon dioxide (CO2) concentration in the atmosphere has increased by more than 35 percent since 1750, the start of the industrial age, and is now higher than at any time in at least 800,000 years. Average annual emissions have increased by about 3% for the past decade. The concentration of CO2 could undergo a further doubling or tripling by the end of the century, greatly amplifying the human impact on climate (Figure 1). Figure 1. 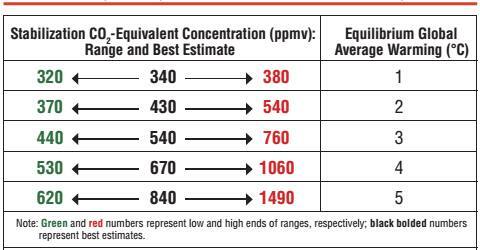 Because emissions of carbon dioxide are greater than the sinks that remove it, emissions reductions larger than about 80% are required if concentrations are to be stabilized. Two degrees centigrade of warming was adopted by the G8 as an aspirational goal primarily because that is all anyone could agree upon. Two degrees centigrade translates to about 1200 gigatons (GtC) of accumulated carbon in the atmosphere since 1750. Currently, the cumulative carbon is slightly under 600 GtC, meaning that humans have locked in about 1°C of current and future global temperature rise since 1750 (Figure 2). Figure 2. Recent studies show that cumulative carbon dioxide emissions is a useful metric for linking emissions to impacts.Error bars reflect uncertainty in carbon cycle and climate responses. Current global emissions are about 10GtC per annum. According to the NAS, the current emissions trend line will reach the 2°C GtC equivalency by 2050 (Figure 3). Because human CO2 emissions exceed removal rates through natural carbon “sinks,” keeping emission rates the same will not lead to stabilization of carbon dioxide. Emission reductions larger than about 80 percent, relative to whatever peak global emissions rate may be reached, are required to approximately stabilize carbon dioxide concentrations for a century or so at any chosen target level. CO2 in the atmosphere is long lived, and the time lags in the climate system, particularly the slow processes in the ocean, can effectively lock earth and future generations into a range of impacts, many of them severe. Emission reduction choices made today will determine impacts experienced not just over the next few decades, but in the coming centuries and millennia. Some effects of 21st century human choices will contribute to climate change for more than 100,000 years. Such extreme persistence is unique to carbon dioxide among major agents that warm the planet. The higher the total, or cumulative, CO2 emitted and the resulting atmospheric concentration, the higher the peak warming and the longer the duration of that warming. Duration is critical; longer warming periods allow more time for key, but slow, components of the Earth system to act as amplifiers of impacts. For example, warming of the deep ocean releases carbon stored in deep-sea sediments. Warming sustained over thousands of years could lead to even bigger impacts. To date, climate stabilization goals have been most often discussed in terms of stabilizing atmospheric concentrations of CO2 (e.g., 450 ppmv CO2e where “e” is CO2 equivalent, that is, factoring in other GHG impacts in terms of equivalent CO2). NAS asserts it is more effective to assess climate stabilization goals by using global mean temperature change as the primary metric. Global temperature change can in turn be linked both to concentrations of atmospheric CO2 and to accumulated carbon emissions. An important reason for using warming as a reference is that scientific research suggests that many key impacts can be quantified for given temperature increases. The Stern Review, predating this evolution in thinking, refers to the concentration of CO2e rather than cumulative carbon. Figure 4 correlates the two methods of reference. As we saw from Figure 1, in the near term, emission reductions larger than about 80% are required to approximately stabilize CO2 concentrations. But models indicate longer-term stabilization requires nearly 100% reduction. This finding is not linked to any particular policy choice about time of stabilization or stabilization concentration, but applies broadly, and is due to the fundamental physics of the carbon cycle. Current representations of the carbon cycle and carbon-climate feedbacks show that anthropogenic emissions must approach zero eventually if carbon dioxide concentrations are to be stabilized in the long term (Matthews and Caldeira, 2008). This is a fundamental physical property of the carbon cycle and is independent of the emission pathway or selected carbon dioxide stabilization target. Recent studies using more detailed models of key feedbacks in the ocean, biosphere, and cryosphere, have underscored that stabilizing radiative forcing (the difference between radiant energy received by the earth and energy radiated back to space) at a given concentration does not lead to a stable climate in the long run. The instantaneous response of Earth’s atmosphere and oceans to increases in greenhouse gases and net radiative forcing represents a transient climate change. Stabilizing atmospheric concentrations does not mean that temperatures will stabilize immediately. Because of time lags inherent in the Earth’s climate, warming that occurs in response to a given increase in the concentration of carbon dioxide (“transient climate change”) reflects only about half the eventual total warming (“equilibrium climate change”) that would occur for stabilization at the same concentration. For example, if concentrations reached 550 ppmv, transient warming would be about 1.6°C, but holding concentrations at 550 ppmv would mean that warming would continue over the next several centuries, reaching a best estimate of an equilibrium warming of about 3°C. Theoretical arguments and numerical models suggest that the efficiency of both the land and ocean carbon sinks may decline in the future under warmer climate conditions, which would act to amplify climate warming. In summary, a given level of cumulative CO2 emissions does not result in stable CO2 concentrations, but rather in CO2 concentrations that peak at some value and then decrease slowly when emissions fall below the level of persistent natural carbon sinks. Even if CO2 emissions become close to zero, the decrease in atmospheric concentrations may occur very slowly over centuries. In a framework of cumulative carbon emissions, CO2 concentrations do not necessarily “stabilize” but rather change over time in response to given CO2 emissions scenarios. It is the total cumulative carbon emitted over time, rather than the atmospheric CO2 concentration itself, that indicates the level of expected climate warming. Enough carbon has accumulated to date to cause 1°C global temperature rise, emissions are on track to cause 2°C rise by 2050 and possibly double that by the end of the century. 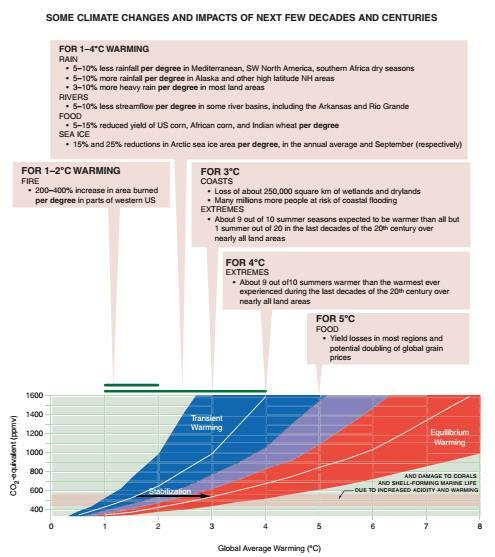 If the above review of the NAS paper is compelling enough to accept that our actions or inactions now will have consequences for thousands of years, and that current business as usual trends do not portend well for our future—suggesting a level of urgency to begin reducing our emissions—then the next step is to explore the outcomes from possible temperature rise scenarios (Figure 5). Models suggest that the average intensity and destructive potential of tropical cyclones is likely to increase by roughly 3-12% per degree. For warming levels of 1 to 2°C, the area burned by wildfire in parts of western North America is expected to increase by 2 to 4 times for each degree of global warming (Figure 6). Increased tropical fire associated with El Niño droughts may contribute to increases in the growth rate of atmospheric carbon dioxide concentrations during recent El Niño years. Warming of a few degrees can be expected to lead to large impacts to water resources, especially in the southwestern and southern parts of the United States. 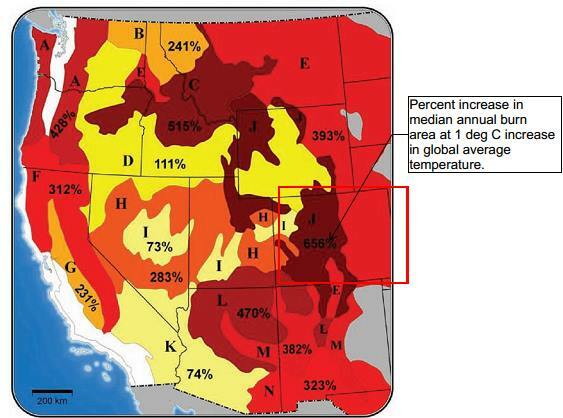 Decreases of about 12% per degree are projected for the Rio Grande basin. About 15 percent and 25 percent decreases in the extent of annually averaged and September Arctic sea ice, respectively, are projected worldwide. A 2°C global temperature rise would be sustained for millennia. This could lead to eventual sea level rise on the order of 1 to 4m due to thermal expansion of the oceans and to glacier and small ice cap loss alone. Melting of the Greenland ice sheet could contribute an additional 4 to 7.5m over many thousands of years. Adaptations to sea level rise will be ongoing and expensive—ports and infrastructure will repeatedly have to be altered over time. It has been projected that 0.5m of sea level rise would increase the number of people at risk from coastal flooding each year by between 5 and 200 million; as many as 4 million of these people could be permanently displaced as a result. More than 300 million people currently live in coastal mega-deltas and mega-cities located in coastal zones. The corresponding projections for 1.0m of sea level rise suggest that the number of people at risk of flooding each year would increase by 10 to 300 million. Global climate change in is expected to reduce yields of key food crops in some tropical regions by about 7-15% per °C of global warming while global demand for cereal crops can be expected to rise by about 25%. Global warming of 2°C would be expected to lead to average yield losses of U.S. corn of roughly 25%. Nearly 40% of global corn production occurs in the United States. Part II outlined projected physical impacts. Of course, those physical impacts will have economic implications. The 2006 Stern Review focused on the feasibility and costs of stabilization of greenhouse gas concentrations in the atmosphere in the range of 450-550ppm CO2e. Since that time, its conclusions about likely climate change manifestations have been borne out by better modeling and understanding of the Earth’s climate system. In fact, this enhanced understanding indicates that the trends projected in the Stern Review are accelerating and the implications more severe than initially understood. Like the NAS study, the Stern Review evaluation of climate research indicated that temperature changes resulting from business as usual trends in emissions may exceed 2-3°C within the next 50 years. At 4°C and above, global food production is likely to be seriously affected and, according to one estimate, by the middle of the century 200 million people may become permanently displaced due to rising sea levels, heavier floods, and more intense droughts. It is estimated that 15-40% of species may face extinction after only 2°C of warming. The impacts of climate change are not evenly distributed; the poorest countries and people will suffer earliest and most. With 5-6°C warming—which is a real possibility for the next century—models that included the risk of abrupt and large-scale climate change estimated an average 5-10% loss in global GDP, with poor countries suffering costs in excess of 10% of GDP. Stern estimates the total cost over the next two centuries of climate change involves impacts and risks that are equivalent to an average reduction in global per-capita consumption (GDP is calculated using several measures, consumption is the single most important component) of at least 5%, now and forever. While this cost estimate is already strikingly high, it also leaves out much that is important. First, including direct impacts on the environment and human health (sometimes called ‘non-market’ impacts) increases the estimate of the total cost of climate change on this path from 5% to 11% of global per-capita consumption. Second, recent scientific evidence indicates that the climate system may be more responsive to greenhouse gas emissions than previously thought. Modeling a limited increase in this responsiveness indicates an increase in the cost of climate change from 5% to 7% of global consumption, or from 11% to 14% if the non-market impacts described above are included. Third, a disproportionate share of the climate change burden falls on poor regions of the world. If this unequal burden is weighted appropriately, the estimated global cost of climate change at 5-6°C warming could be more than one-quarter higher than without such weights. Putting these additional factors together would increase the total cost of climate change to the equivalent of around a 20% reduction in consumption per head, now and into the future. Analyses that employ the basic economics of risk suggest that climate change will reduce welfare by an amount equivalent to a reduction in consumption per head of between 5 and 20%. Taking account of the increasing scientific evidence of greater risks, of aversion to the possibilities of catastrophe, and of a broader approach to the consequences than implied by narrow output measures, the appropriate estimate is likely to be in the upper part of this range. Stabilization, at whatever level, requires that annual emissions be brought down to the level that balances the Earth’s natural capacity to remove greenhouse gases from the atmosphere. The longer emissions remain above this level, the higher the final stabilization level. In the long term, annual global emissions will need to be reduced to below 5 GtCO2e (1.35 GtC), the level that the earth can absorb without adding to the concentration of GHGs in the atmosphere. This is more than 80% below the absolute level of current annual emissions (the same conclusion as NAS). Stabilizing at 450ppm CO2e, which correlates to a 2°C temperature rise, means that global emissions would need to peak in the next 10 years and then fall at more than 5% per year, reaching 70% below current levels by 2050. By looking at the resource costs of measures, including the introduction of low-carbon technologies and changes in land use, compared with the costs of the business-as-usual alternative. This provides an upper bound on costs, as it does not take account of opportunities to respond involving reductions in demand for high-carbon goods and services. Using macroeconomic models to explore the system-wide effects of the transition to a low-carbon energy economy. Resource estimates suggest that an upper bound for the expected annual cost of emissions reductions consistent with a trajectory leading to stabilization at 550ppm CO2e is likely to be around 1% of GDP by 2050. Macroeconomic models confirm these estimates. The average expected cost is likely to remain around 1% of GDP from mid-century, but the range of estimates around that 1% diverges strongly thereafter, with some falling and others rising sharply by 2100, reflecting the greater uncertainty about the costs of seeking out ever more innovative methods of mitigation. There is a high price to delay. Delay in taking action on climate change would make it necessary to accept both more climate change and, eventually, higher mitigation costs. Weak action in the next 10-20 years would put stabilization even at 550ppm CO2e (1800 GtC emitted) beyond reach—and this level is already associated with significant risks. Costs of mitigation of around 1% of GDP are small relative to the costs and risks of climate change that will be avoided. The evidence suggests aiming for stabilization somewhere within the range 450-550ppm CO2e, or 2°C to 3°C temperature rise (again, this is consistent with the NAS findings). Anything higher would substantially increase the risks of very harmful impacts while reducing the expected costs of mitigation by comparatively little. Aiming for the lower end of this range would mean that the costs of mitigation would be likely to rise rapidly. Anything lower would certainly impose very high adjustment costs in the near term for small gains and might not even be feasible, not least because of past delays in taking strong action. Preliminary calculations suggest that the social cost of carbon, i.e., the net changes in the expected benefits and costs over time from reductions in emissions, if we remain on a business as usual trajectory, is of the order of $85 per tonne of CO2. Preliminary work suggests that, if the target were between 450-550ppm CO2e, then the social cost of carbon would start in the region of $25-30 per tonne of CO2—around one third of the level if the world stays with business as usual. The social cost of carbon is likely to increase steadily over time because marginal damages increase with the stock of GHGs in the atmosphere, and that stock rises over time. In summary, most people understand that that we have a problem that is getting worse and the more we delay taking serious action, the more difficult it will be to counter the consequences. The Stern Review argues that it makes economic sense to reduce GHG emissions and to do it now rather than later. The investments made in the next 10-20 years could lock in very high emissions for the next half-century, or present an opportunity to move the world onto a more sustainable path. In 2002, Boulder passed Resolution 906, adopting the Kyoto Protocol that set a Boulder goal of reducing GHG emissions to a point 7% less than 1990 levels. Since then, Boulder has enacted many programs that have been effective in reducing our emissions. The kinds of emission reductions that are needed to stabilize CO2 concentrations and to cap temperature rise at 2°C should enable us to evaluate the effectiveness of Boulder’s current goals and programs and their ability to meet challenges of the future. Figure 7 compares Boulder’s annual emissions from fossil fuels since 1990 to our Kyoto target. Despite efforts, the trend lines are divergent and indicate the need to reassess our strategy. 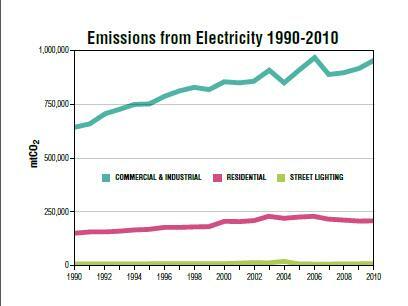 Figure 8 illustrates Boulder’s CO2 emissions from electricity since 1990. While residential emissions are leveling out (possibly due in part to the recession), commercial building related emissions continue on their historical trajectory, unabated. Figure 9 compares the percentage change in cumulative CO2 since 1990 among Boulder, Germany, the USA and the world. Boulder’s rate of increase is greater than the USA’s. Germany’s is significantly lower, demonstrating that much better performance toward emission reduction is possible. 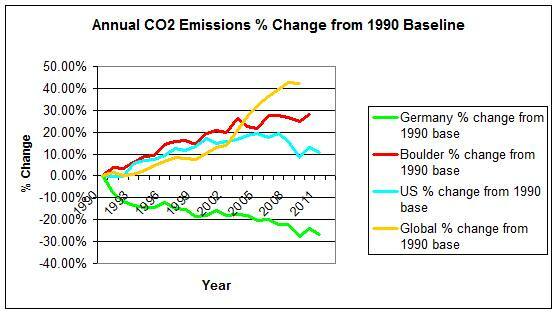 Figure 10 compares the percentage change in annual CO2 since 1990 among Boulder, Germany, the USA and the world. Boulder’s change is greater than the USA’s, and Germany’s is significantly lower. 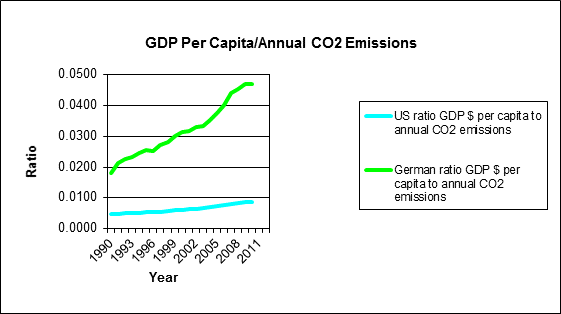 Figure 11 establishes a ratio of GDP to annual CO2 emissions and compares the USA to Germany. Germany’s trend line not only starts from a higher level, but has a much steeper slope indicating not only better economic performance than the USA but also decreasing emissions. Figures 12 and 13 following, dissect this further. 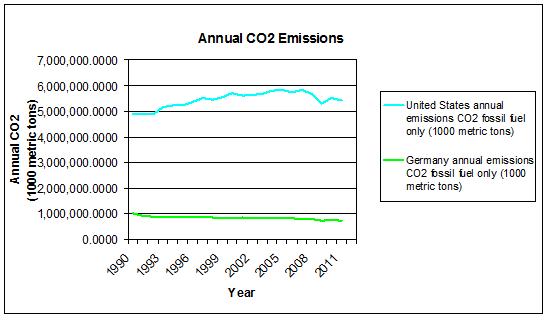 Figure 12 compares Germany’s annual CO2 from fossil fuels emissions to the USA’s. Germany’s emissions have fallen whereas the USA’s have risen (the decline in the late 2000s is probably attributable to the recession). When viewed in combination with Figures 10 and 11, it indicates that aggressive action on GHG emissions reduction does not necessarilly suppress economic performance. 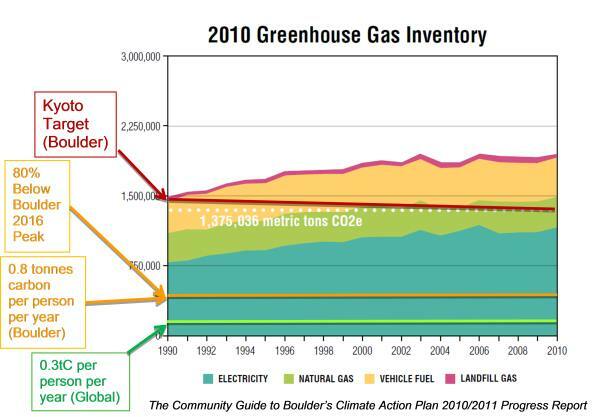 In summary, Boulder has made significant efforts to reduce its GHG emissions. 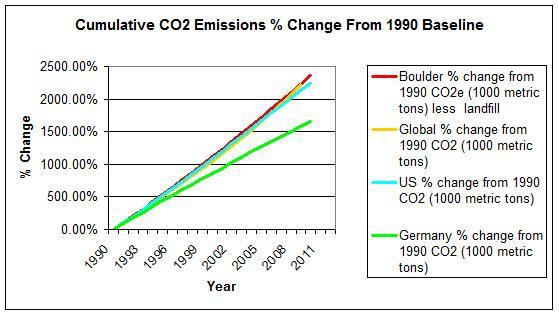 However, relative to the entire USA, Boulder’s emissions have increased. The USA as a whole, when compared with Germany—another large, mature, industrialized economy—significantly underperforms both in terms of emissions per unit of productivity and overall emission reduction. The lesson is that the USA and Boulder are not adequately meeting the challenge of climate change, but can, as Germany’s example illustrates, do so without wrecking the economy. The previous sections make the case that we can and must address climate change by reducing GHG emissions to the equivalency of a 2°C temperature rise. The next step is to derive a specific target including a timeline for achieving the target. Using the findings in the NAS and Stern Review documents, we suggest limiting cumulative GtC to a 2°C temperature rise by establishing an emissions reduction rate that would achieve an 80% reduction in annual emissions by 2050. A global, annual emissions reduction rate of 4.6% results in an 80% reduction in annual emissions by 2050. A lower rate of emissions reduction will push the 80% reduction and the cumulative stabilization point further into the future. For example, were the annual emissions reduction rate only 2%, the 80% reduction would not occur until 2210 and annual emissions would not be reduced to zero until 2629, 616 years from now and 2.3 times longer than a 4.6% rate. 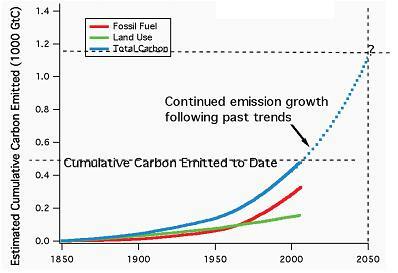 Cumulative emissions would also exceed 1200GtC, crossing the 2°C threshold. Against this global backdrop, we can establish a target reduction rate discussion for Boulder: 4.6% annual decrease in all Boulder GHG emissions to get to a 2°C locked-in planetary temperature rise. 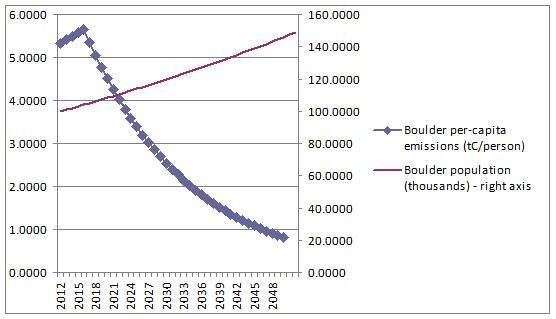 Figure 13 below illustrates this emissions reduction profile for Boulder and includes expected population increase over that time span. Currently, global per capita annual emissions are 1.53 tons of carbon vs. 5.33 in Boulder. Under the 4.6% annual emissions reduction scenario, by 2050 Boulder’s annual emissions will be reduced 80% below the current level but per capita emissions will still be 2.8 times greater than global. It should be noted that Boulder emissions in this analysis come from the CAP, so do not include certain externalities such as Boulderite air travel emissions, whereas the global values include all emissions. Nonetheless, a 4.6% annual reduction in emissions might be an appropriate global target to set as a basis for deriving a Boulder emissions target. Boulder is not doing enough to meet the challenge of climate change. It is economic to reduce GHG emissions and more economic to start doing it now rather than later, even at a 5% annual reduction rate. Actions taken or not taken in the next decade could lock in very high emissions for the next half-century, or present an opportunity to move the world onto a more sustainable path. There is a high price to delay; delay in taking action on climate change will make it necessary to accept both more climate change and, eventually, higher mitigation costs. 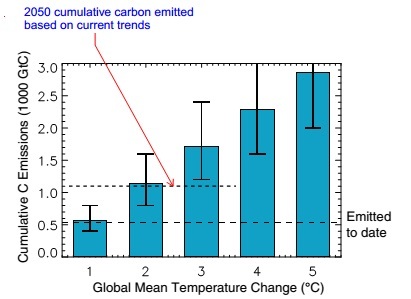 The higher the cumulative carbon dioxide emitted, the higher the peak warming and the longer the duration of that warming. Duration of warming is critical; longer warming periods allow more time for key components of the earth system to act as amplifiers of impacts. Warming sustained over thousands of years could lead to even bigger impacts. Update: a correction was made to the last sentence before Part VI. Update 8/23/13: Figure 11 was replaced, Figure 13 and associated text deleted, and Figure 14 renumbered.